Pitbull has made it to the top of the charts with Give Me Everything. The rapper's track finally reached the top spot after entering at number 12 two weeks ago, and then rising to number four last week. 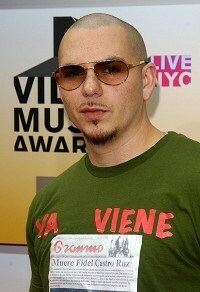 Pitbull also features on another track in the top 10, Jennifer Lopez' single On The Floor which is at number 10. There were two new entries in the top 40, Swedish House Mafia with Save The World at number 11, and Hair by Lady Gaga at 13. In the album run down queen of the charts Adele reigned supreme at number one. There were two new entries in the top 10 - Director's Cut by Kate Bush at two which features re-worked versions of her former hits, and Friendly Fires' Pala at six. Elsewhere in the chart Rome by Danger Mouse and Danielle Luppi went in at 20, dance veteran Moby's Destroyed was at 35 and Mona's eponymous album entered at 39.